I saw a video the other day that explained one of the reasons I’m such a terrible salesman and marketer. I suspect it will be life-changing for me. It talked about products or ideas and the what, how, and why of those ideas. 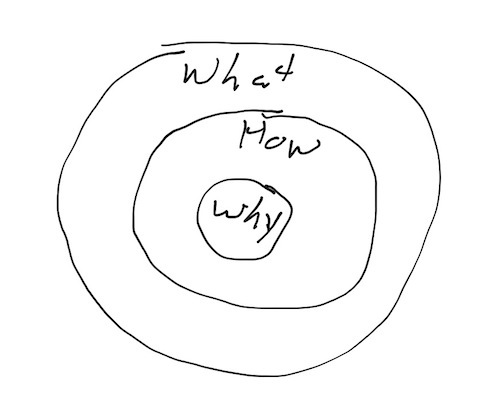 He said most companies begin with “what,” and they may explain “how,” but they never get to “why.” Then he said people don’t buy what you have to sell. They buy what you believe. It is most important, he said, to tell them “why” you believe what you believe, not what you want your audience to receive. I can’t really explain why that “clicked” for me. I’ve always been told that I need to know who my audience is when I write. I’ve also been told that I need to write in such a way that my readers know what’s in it for them rather than just what I want to tell them. It’s about the reader, not about me. The Gospel as it was given by King Jesus to the apostles, and then by the apostles to the church. The ramifications of pursuing that Gospel are phenomenal because we have lost so much of it. Yes, we are doing good things. Yes, people are getting saved. Yes, there are some phenomenal, powerful Christians and churches in our day. Yet, just because those things are true, do we really want to ignore the fact that 60% of Americans who think they are Christians admit they are either static or backsliding in their spiritual life? Do we really want to ignore the fact that the world sees Christianity as representing the height of division when Jesus said that our unity is what would prove he is the Son of God? (Jn. 17:20-23). Do we really want to ignore the fact that 90% or so of those who make a profession of faith, walk the aisle, or pray a sinner’s prayer are going to fall away? Do we really want to ignore the fact that most of our pastors have no close friends and that many need counseling as a result? I could go on and on, but one primary issue that touches me is that God has promised to set the solitary in families, and we usually offer to set them in an audience. In best case scenarios, one person follows up on them in a mentor capacity. When I write such things, I am not complaining. I am making a case for returning to the faith once delivered to the saints. It addresses every one of those problems without directly addressing any of them. Return to the faith the apostles preached, the Gospel that was lived out in their churches, and every one of those problems I just listed will disappear like a thick fog burned away by the sun. We would have new problems instead. The kind of problems Paul, Peter, James, and John wrote about in their letters. The apostles writings would come alive to us because we would be reading them in the same environment they wrote them in. The last thing the man in the video said was that our audience is the people who believe what we believe. I believe that there is nothing greater than to continue daily in the apostles’ teaching, the breaking of bread, prayers, and fellowship. I believe there is nothing greater than sharing all things and being part of God’s family, headed up by King Jesus, love pouring down from heaven as the perfect bond of unity, and being taught together by the Lord God himself. Everything I write is toward that purpose. To that I am willing to commit myself. And if I am alive from the dead, living a second chance of life after recovery from a normally fatal disease, then that is what I am alive for. I will fight to my last breath for the faith once delivered to the saints because it delivers to the saints all the promises of God. This entry was posted in Church, Gospel, missions, Unity and tagged apostles' teaching, faith once delivered, Gospel, purpose, the church, why. Bookmark the permalink. Yes, yes, and again yes. This is such a refreshing read. Thank you! I can’t believe you would judge me like this! Just kidding. This is really helpful criticism. Thank you. My problem, Paul (and I write this from the perspective of a virtual friend and not just some internet randomer), is as follows. Who exactly do intend the primary audience of your blog and website to be? In other words, who are you aiming this at? Are you hoping that deceived unsaved Christians will read it and be convicted? If so then I hope you will not be offended by a slight criticism. I have found (please show me if I’m wrong) little direct application of what you teach about salvation etc. in your posts. In other words, there tend to be no instructions or pleas for repentance. Instead there is often just a long rant (maybe with a vague implication that you and RCV are doing it right) , then that’s it. I have found this on many, many places online. There are loads of folks out there who are obviously fed up with American Christianity, and they tot up rant after rant on blogs and websites, and link sermon after sermon about the ‘apostate church’ or ‘false Christians’ or ‘goats’ etc. With most of these though, there is no appeal in their message, no invitation or even a command, other than to maybe pray and hope God saves you. For example, I listened to a recent sermon by David Servant entitled “False gospels and Watching Virgins” (at a sermonindex conference) . The basic message seemed to be “Loads of people are deceived and going to hell – hopefully not us. Period.” No application – what the flip is the point of that? After reading/listening to this kind of thing, it is difficult not to get the impression that such folks are more interested in venting off frustration than actually convicting people and saving souls. Please do come back at me on anything (or everything) I’ve said here. This is italicized and this is bold. I watched a TEDTalk some time back (perhaps the same video you watched) about having a vision and believing in it as the basis for “why” we do things and “why” some are successful and others not so successful. As Christians, it is our faith that distinguishes us from those around us, because it is our faith that makes it possible to love those around us, even when they may not be so loveable by worldly standards. Our faith makes it possible for us to do the works, and our works prove our faith. BYW, I am enjoying the scriptures on works. Thanks. No, I don’t. I linked the article based on just the preview paragraph. It was on my list of blogs to read, but now it is as gone for me as it is for you. Sorry about that.